Joe Quinones' interweb-log: Spidey: The Vampire Slayer? Sorry I haven't been all too present on the interwebs as of late. I've been drawing! Anywho, here finally is an update on some of the stuff I've been working on. 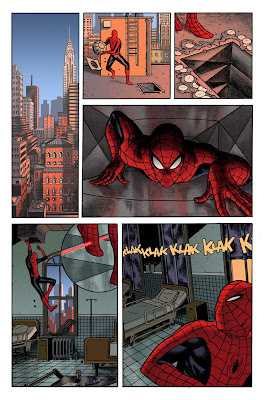 The above panel is an exerpt from an up and coming story written by Fred Van Lente that will be appearing in issue 622 of 'Amazing Spider-man' later this month. Here's a sneak peak at one of the pages. Hope you like! Love the look of your Spidey! !